EDITION LIMITED TO ONLY 990! This artwork has been sold out from the publisher for some years! Now found only in private collections. Not including the added value of extra enhancements! Village Christmas is the Eighth painting in Thomas Kinkade's Christmas Cottage series. Village Christmas depicts holiday preparations from a simpler time in a quaint village typical of those seen throughout the Sierra Foothills such as Thom's hometown of Placerville CA. The horse-drawn sleigh in the lower right-hand corner is from an actual model sleigh that is used in their home to store the children's books. Village Christmas features 4 hidden N's in tribute to his wife, Nanette. 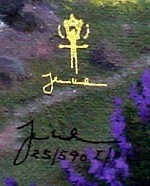 ++++ Tom created this painting in November 1997. ++++ RARE! This edition is limited to only 990 in the world! 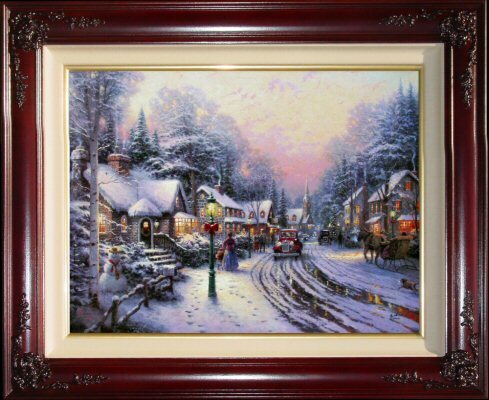 ++++ Brass Plaque with the legend "Village Christmas ~~ Thomas Kinkade"
++++ Theme ~~ Christmas, Village, People, Cars, Lamppost, Birds, Snow, Horses, Trees, Houses. 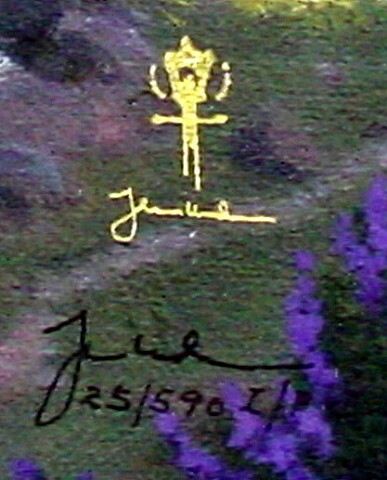 International Proof Edition (I/P) All International Proof (I/P) Editions are individually Hand Highlighted with oil paint. 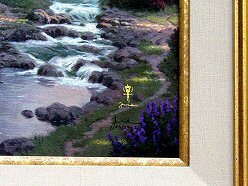 International Proof Editions include a Gold Foil-stamped I/P logo on the canvas within the image with Thomas Kinkade's signature in gold below the logo followed by the Thomas Kinkade's authorized security signature featuring DNA technology and individually hand numbered serial number corresponding to the Certificate of Limitation and Authenticity of the I/P edition. 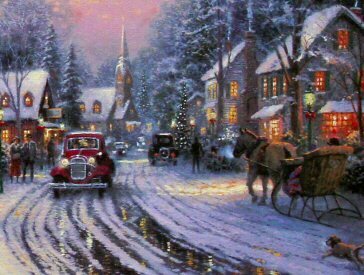 "Christmas is my favorite time of year. 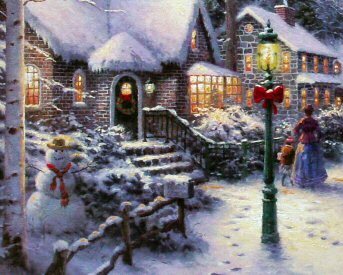 The artist side of me is drawn to the lights and visual elements of the season. 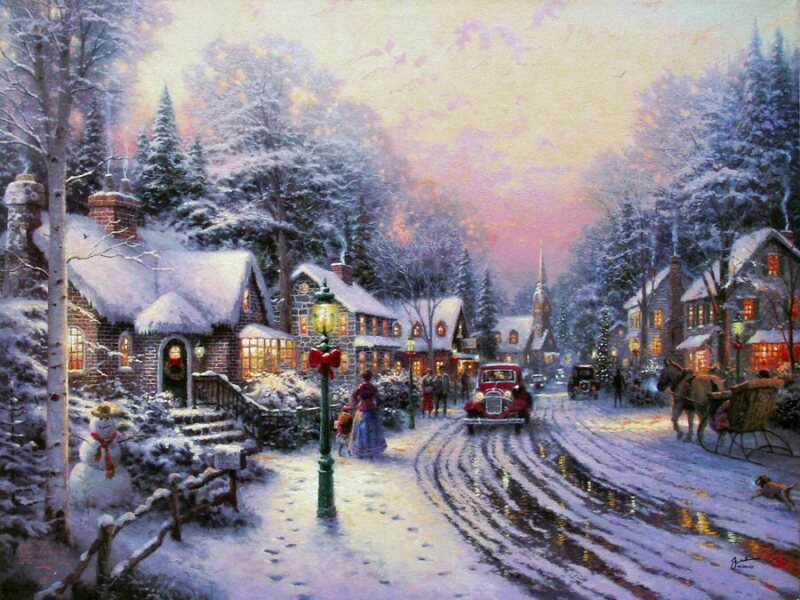 In Village Christmas I have tried to capture a Christmas of a simpler time, where street lamps glow with the warm light of a natural flame and the townsfolk use a leisurely stroll to church as the opportunity to stop and chat about this joyous season." You didn't say, so I assumed you did not want it posted at auction today.